Introduction: In one of the XKCD comics, titled "Nerd Sniping," there is an interesting problem presented as a way to involuntarily distract certain types of people (physicists, mathematicians, etc). Being an electrical engineer, I wanted to try and solve this problem in a more typical engineering way than to use math and symbolic manipulation: Successive Approximation! I'll start with the simplest case (see image below) and add more and more resistors to try and approximate an infinite grid of resistors. 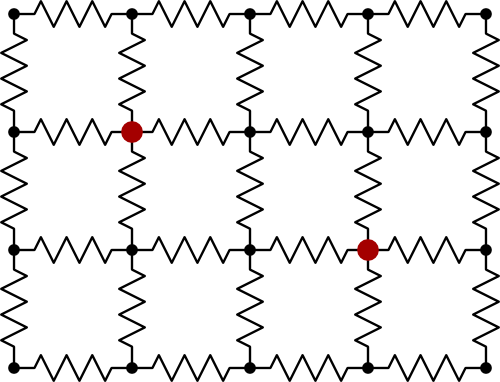 Notation: The simplest grid (with the fewest resistors) is shown below this paragraph. It has six nodes and seven resistors, arranged with three nodes across and two nodes vertically. 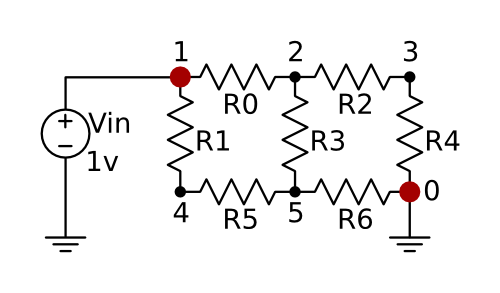 We take the number of nodes in the longest side as our characteristic id number, so we call this circuit grid_3. If we add another layer of nodes all around the existing circuit, we end up with this grid, with five nodes on the longest side. Solution Method: I thought it would be interesting to try and use circuit simulation to find the equivalent resistance. While I have experience with the more "graphical" circuit simulation tools such as made by Cadence and Synopsys, I had never before worked with SPICE from the command line, so I thought I would try to do the simulations with HSPICE. In the simplest circuit above, a 1 volt DC power supply is connected to the grid of seven resistors. Both the nodes and resistors are labeled, which will come in handy later when writing the HSPICE input file. We can generalize the circuit generation scheme with the following python script. It should be called with a single argument: the number of nodes on the longest side. It generates a circuit file suitable for simulation with HSPICE, as explained in the next section. # Generates degenerate cases of an "infinite" grid of resistors. # Designed to be used with HSPICE, maybe others. print "long_side must be odd and >= 3!" Here is another look at the annotated schematic for the grid 3 circuit. The rather simple HSPICE circuit file is shown after the schematic. In SPICE, node 0 is the ground node. Here, I have defined the seven resistors and the DC voltage supply. The .OP line tells HSPICE to find the operating point (DC steady-state) of the circuit. 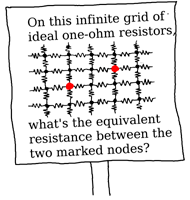 This equivalent resistance is 1.4 ohms for a grid that is 3 nodes wide by 2 nodes tall. We repeat for larger simulations, with the results shown in the table below. * Simulation did not finish (out of memory error). Conclusions: After looking for other solutions online, it appears that the correct, exact answer is 4/pi - 0.5, which is the same as the answer found here. Apparently it involves some 2D Fourier series analysis, which I'll save for another day.